Looking to upgrade your employees’ skills? Thanks to a new round of funding from the NJ Department of Labor and Workforce Development, New Jersey businesses can now apply for expanded employee training under a popular program that’s got a new name. The NJBIA Basic Skills Workforce Training Program, also known as Employability Skills Training, is now in its 8th year and still growing in popularity. We know it’s popular because it keeps getting bigger. More than 5,000 New Jersey companies like yours have used it to train over 75,000 employees. Here are four good reasons why your company should participate in this program, if it hasn’t done so already. It’s Free: The training is available at no tuition charge to your company or its employees. Any private-sector employer in the state can participate as long as they are in compliance with state tax law. Higher Skills Equal Business Growth: Your employees will develop new skills essential to your business operations. Employees with higher skills make a bigger contribution to your company’s productivity, profitability, and growth. This also helps you retain valued employees. On-Site Training: If you have enough employees in need of training (generally 10 or more), the classes can be held on-site at your business. If not, your employees can get training at an open-enrollment class near your place of business. Quality Instruction: Instruction is provided by seasoned adjunct professors, many with business experience, at the state’s 19 community colleges. As in the past, your employees can get training in PC skills (Excel, Word, and Outlook are especially popular), communications (verbal, written and customer service), mathematics and measurement, English as a second language, and Spanish in the workplace. Under the expanded program, they can now learn other skills such as problem solving, personnel management, employee supervision, and team building. 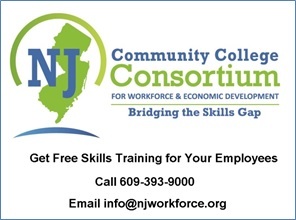 The NJBIA Basic Skills Workforce Training Program is a partnership of NJ Community College Consortium, which manages it, the New Jersey Business & Industry Association (NJBIA), and the NJ Department of Labor. If you are interested, please contact us! If you’re looking for software solutions to track employee training, consider EHS Insight training management software.